Our artist Hugh Syme recently completed a fantastic collaboration with Canadian rock band, Rush. Hugh is responsible for the cover art on their newest (and nineteenth!) 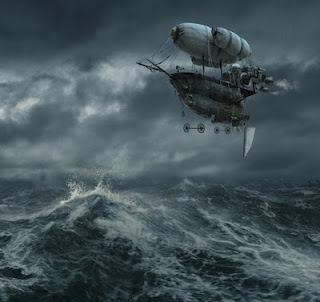 album, Clockwork Angels (2012), as well as the images inside the album’s accompanying novel, and the cover art for Rush’s subsequent tour book. In fact, Hugh is responsible for most of the band’s artwork over the last 36 years, since he’s the band’s art director, designer, illustrator, and principal image maker. This partnership between the visual arts and music has proven the importance of interdisciplinary collaboration. Hugh’s work with Rush began in 1975 with the cover for Caress of Steel (1975). 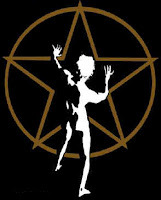 But his most iconic contribution may be the band’s logo–the “Starman” emblem–which Rush fans adopted after its original appearance on the 2112 album (1976). 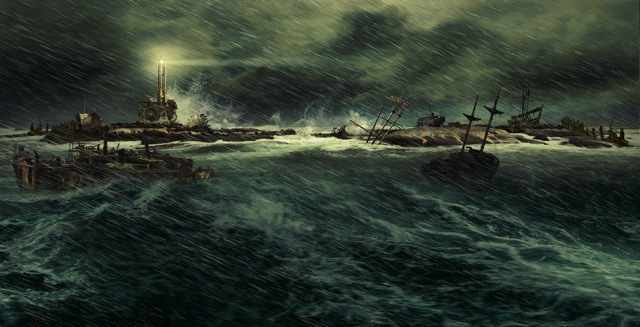 Hugh has also created cover art for Aerosmith, Megadeth, Styx, Def Leppard, Dream Theater, Celine Dion, Bon Jovie, Iron Maiden, and Queensrÿche, but he is forever associated with Rush’s epic sagas. 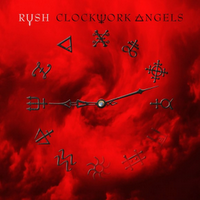 Hugh’s work on Clockwork Angels began nearly two years ago, after Rush recorded their first two songs for the album. The band immediately began the Time Machine tour in 2010, during which they leaked these two songs, “BU2B – Brought Up to Believe” and “Caravan.” But the remainder of the album remained unwritten, unrehearsed, and unrecorded for nearly a year. 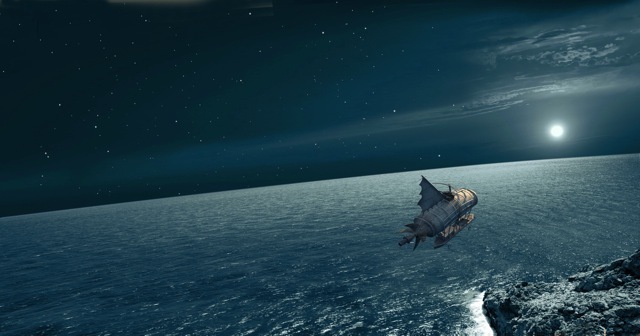 When the Time Machine tour entered its second phase in 2011, Hugh began to delve deeply into the concepts for the album’s packaging. Originally, Hugh and Rush drummer Neil Peart wanted Clockwork Angels‘ cover to be urban and edgy, so they drew inspiration from the British tag/graffiti artist Banksy. But as time passed, the tone and imagery for the album developed and took on a life of its own. 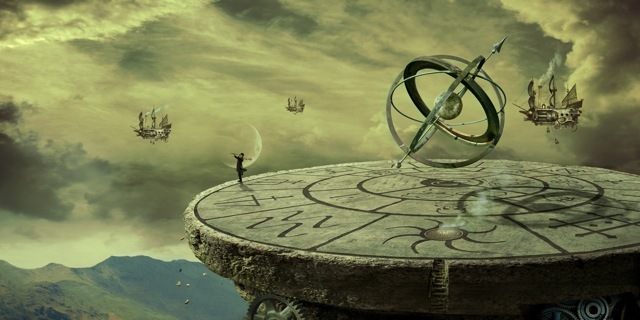 Still liking the original art, Hugh and Neil decided to use it for the cover of the tour book, which accompanies what one might call the third part of the Time Machine tour: their much anticipated upcoming Clockwork Angels tour in September, 2012. We are so proud to have supported Hugh throughout his lifelong collaboration with Rush. We anticipate many more wonderful things from Hugh and Rush, and we can’t wait to see, hear, and experience them all! –As published on Mendola Artists’ Blog. CLICK HERE for more of Hugh’s work and check out his Altpick page. This entry was posted in Altpick, Art, Branding, Design, Illustrations and tagged Aerosmith, album packaging, Banksy, Billboard 200, bon jovie, celine dion, Clockwork Angels, def leppard, dream theater, Hugh Syme, iron maiden, megadeth, Neil Peart, queensryche, Rush, styx, Time Machine album, tour book. Bookmark the permalink.